It was wet and windy when I looked out of the window first thing this morning. Did I fancy going to parkrun in horizontal rain? Would I rather go back to sleep? It is however Juneathon and as I’ve run 3 parkruns, 3 weeks in a row, it would be a shame not to make it 4 while I can. So my long-suffering OH gave me a lift to the other side of the Isle of Wight where (fortunately it wasn’t raining) I got a warm welcome from a friendly bunch of parkrunners on a grey windy day. It was my third run at medina IOW parkrun but a first run at one of their alternative courses. The parkrun was at Gurnard today (first used over the winter I think when everywhere else was too wet) because of the festival last week at their regular venue and because of Armed Forces Day today at their Appley Park alternative. 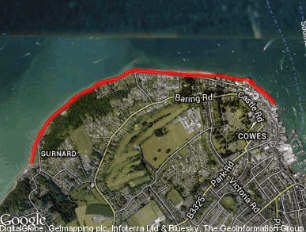 This course is along the seafront from Gurnard to Cowes and back (plus a short double back at the start). It’s run on smooth pavement and is absolutely flat. A lovely fast course with PB potential. Today unfortunately it was very windy. I set a PB first mile as I literally flew the first half with the wind behind me. After the turnaround point at half way the course curved back into the wind and it became hard work. I caught up with one of the regular U14 runners who was struggling running against the wind and she tucked in behind me to get respite from it for a short stretch. It was hard going but I found some motivation from having someone close behind me to keep working and trying not to slow down too much. We finished together and by this time the sun had come out and I was suddenly feeling pretty warm. An IOW parkrun PB of 1 whole second for me today. A slightly slower overall time than last week at Wormwood Scrubs but because of slight differences in the distance run, today was a 5K pace PB for me at 7.55 minute/mile. Just got to work on running a whole parkrun as fast as my first mile today! Juneathon day 22. 3.11 miles in 24.37 mins. 4th parkrun in 4 weeks. Getting the parkrun bug! Categories: Juneathon, running | Tags: Isle of Wight, Juneathon, Medina IOW parkrun, parkrun, Running | Permalink. Good going. I`m jealous, because I couldn`t even get out of bed yesterday for my first parkrun.